Just bought some case hardening compound from EKP Supplies. I want it for a cylinder that I have machined and would like to try and harden the inner surface. I bought 250g for around £14.00 maybe a tad expensive, but if it is anything like the Kasenit of the past then it will last for ages. 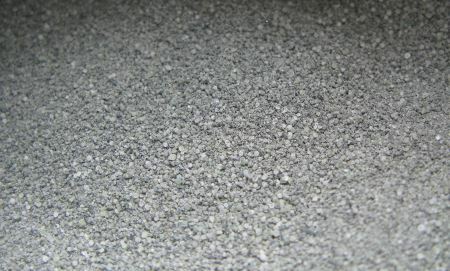 As you can see the case hardening is a consistent grey coloured granular powder. 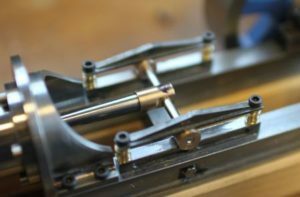 The first job that needed case hardening were the surfaces of the sliding beams for my steam engine turned gas engine. This image shows the 2 sets of upper and lower beams laying on the furnace hearth (an easy to make hearth using stove bricks) ready to be heated up to 850-900°C. I put some of the case hardening compound into a ceramic dish that I have and then placed each of the heated parts into the compound in turn and moved them around in the powder. There is quite a lot of fumes from this and I would recommend good ventilation. I covered the parts in the dish with a metal plate to both keep the heat in for longer and to reduce any chance of the material combusting – which apparently it can. I repeated the process of heating the parts up to a cherry red and placing them into the case hardening 3 times. 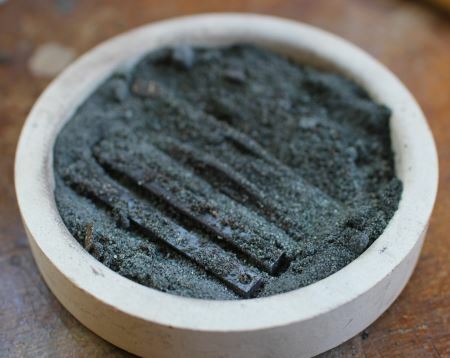 The parts took on a crust of black carbon and the powder changed to a much deeper black carbon looking mix where it was heated by the parts. Once I felt happy with the length of time in the case hardening I finally heated the parts up and quenched them in cold water. The cleaned and assembled parts on the engine (transitional engine). 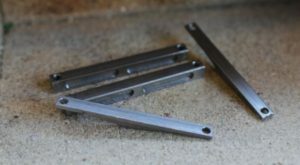 Some more work to do to get these to a final finish, but cleaning the surfaces gave me a good feel about the hardening of the mild steel parts. I will have to run some tests to see if I can determine how much harder the resultant parts are and will give you feedback on their endurance on this engine. My next problem is whether to buy or make a small high temperature oven that could heat the part and hold it there for 10 minutes or so. 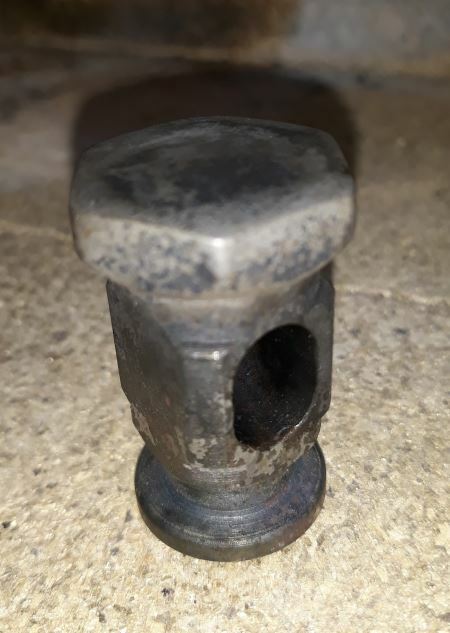 Small Homemade Planishing Hammer – the head was turned and milled from a piece of hexagonal mild steel. The slot was drilled 9.5mm and then open up into an elongated slot using a 10mm slot drill. Quite an easy machining task when using mild steel. Mild steel is not really sensible for the hammer head faces and so I decided to case harden them. 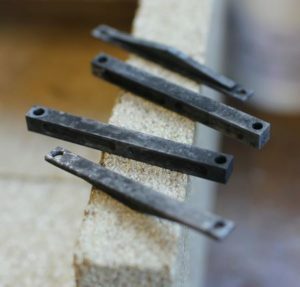 Try using the old gunsmiths trick, fruit stones heated till they change to charcoal, smash with a hammer till a fine powder then use as casnit. Different fruits will give different colours. The best bit is its free.